Rough vacuum, partial pressure of approximately 300 Torr, or atmosphere operation with inert gas (argon). 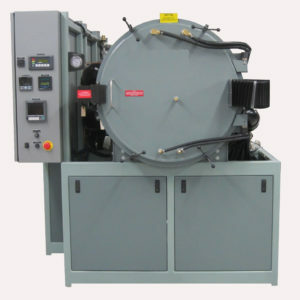 This unit will be capable of maintaining the partial pressure throughout the process cycle. This is a totally enclosed, packaged, and assembled unit that is shipped as one piece. (6) Manual door clamps will be provided, as well as (1) pneumatic cam-over door lock, to automatically hold the door closed during the process. An emergency chamber venting blow-off port will be provided at the rear of the furnace. A key-access manual station will be installed inside the low voltage control cabinet so that the furnace could be operated manually. Remote diagnostics via a telephone line modem, enabling us to remotely aid in diagnostic troubleshooting the furnace and guide your maintenance people directly. This feature provides immediate, real-time support. Automatic thermocouple retractor system with two-color optical sensing device, close-looped to the temperature controller. This system will control from room temperature to 2500° C.
Quartz sight port (with purging). Digital vacuum gauge with adjustable setpoints and alarms so that partial pressure setpoints can be set and maintained. Digital high limit temperature controller. This controller will be tied to a moly-sheathed, tungsten-coated Type “R” thermocouple. Mechanical vacuum pump with Roots blower. Package pumping speed of approximately 150 CFM. All new graphite hot zone, 4” thick. All new graphite heating elements on the left and right sides. Graphite hearth rails and supports will be provided. (4) Front panel-mounted digital indicators with alarms to continuously monitor and alarm power feedthrough drain water temperature. (8) Standard water flow meters will be provided: one for the front door, two for the main chamber, one for the back of the chamber, one for each of the four power feedthroughs. We provide operating procedures, complete detailed electrical schematics, and manuals for all instrumentation and controls on the furnace.